This is the second instalment of my “easy felt project” series. I know some people feel it is a bit early for the “C” word but I thought I would give you a taste of what we will be making this year for Christmas. Get prepared because I will start posting related tutorials around mid October. 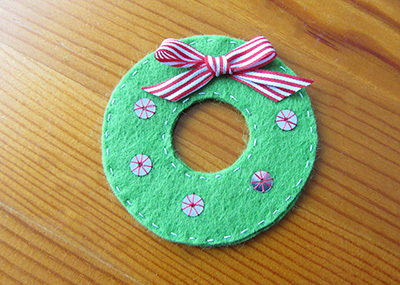 Today we make a felt mini Christmas wreath with the cutest little bow and some glimmery sequins. It is 6cm (2 1/2”)across. 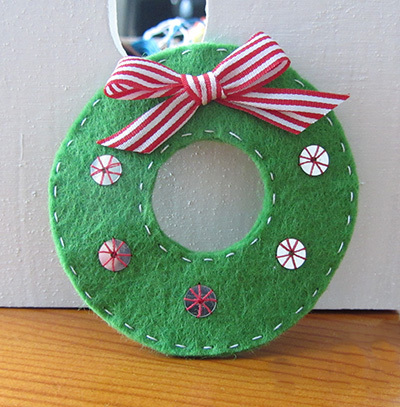 It can be used as a tree ornament or a table decor. 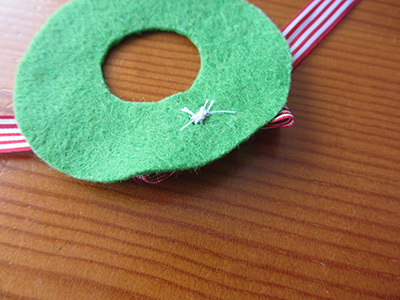 If you make several of them, then could certainly make a very cute garland. 1 – Trace a 6cm (2 1/2”) diameter circle. 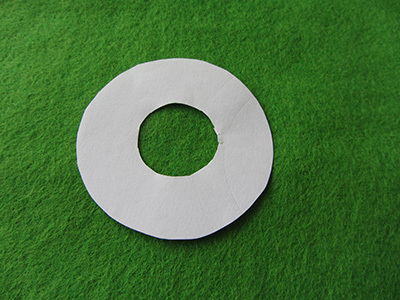 In the centre, draw a second circle around 2.5cm (1”) diameter. 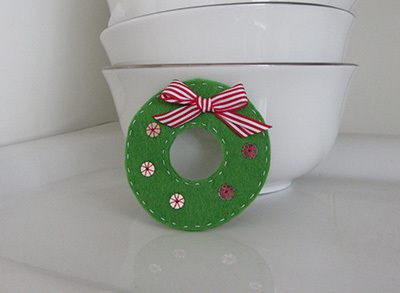 Cut out the smaller circle and you’ll end up with a wreath template as shown on picture 1. 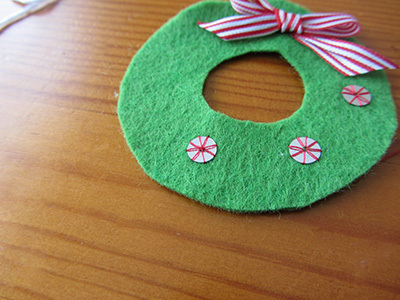 2 – Lay felt squares on top of one another, trace the wreath shape and cut both layer at the same time. You’ll end up with two felt shapes matching the paper shape. 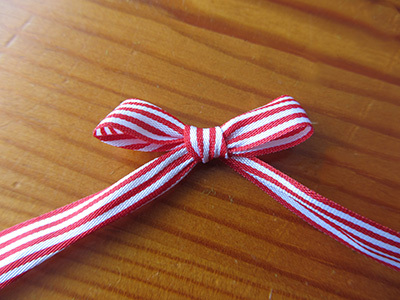 3 – Make a small bow with the ribbon: just proceed as if your were tying your shoe lace and then adjust shape and size. Make a small stitch hidden inside the knot so it doesn’t untie. You now have a little bow as shown on picture 3. 4 – Secure the bow on the top of one of the wrath shapes with some stitches made from the wrong side of the felt so they don’t show on the right side, as shown on picture 4. Trim bow ends as needed. 5 – Stitch each sequin using some red thread. First make four stitches (see picture 5.1) and then make 4 more stitches in between (see picture 5.2). 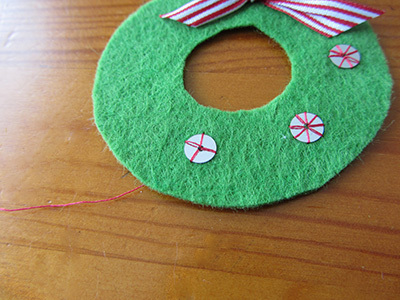 6 – Make a running stitch along inner and outer edges of the wreath, using white thread. Make sure to hide starting and finishing stitches between the two felt layers. The end. Have you started getting ready for Christmas yet? Some shopping done? Some planning made? Or are you the kind who would prefer doing things last minute? Or a bit of both? Previous Post Here you go: I’m a finalist! Thanks Mrs M, glad you like it. if you make one or more, would you mind sending pictures to share here? I would love to see what you make! Never too early for Christmas stuff! Really cute, I’m a big fan of bows! You’re so right, I could make Christmas stuff all year round 🙂 THanks for passing by and commenting.